Frame Dance Productions’ Dinner/Dance 19. Photo by Jonathon Hance. Just when I thought Houston dance was experiencing a bit of a lull, in walks a gaggle of Search Optimizer workers, Deuce Ticklebeetle, Shelly Kelly, Roxi Wright, Gretchen Charise Kittridge, Gwenevieve Hues, and Alyssa Roberts, to Good Dog Houston to mess with our heads. The event was part of Frame Dance Productions Dinner / Dance 19, a dance/theater/dinner installation conceived by Lydia Hance and her “framers,” with chefs David Leftwich (Sugar and Spice Magazine), Adam Dorris (Revival Market) and Richard Knight (Down House & Hunky Dory) handling the marvelous dinner portion of the evening. How clever of Hance to mix Houston’s passionate food and dance cultures in one evening. Before we go any further describing the proceedings on the evening of May 19, 2014, it’s best to know more about the characters at Search Optimizer. Deuce (Alex Soares) goes by “Beetle” and is the boss’ son. He’s a loafer, who does little and takes all the credit. Beetle is also a player and has a way with the ladies. 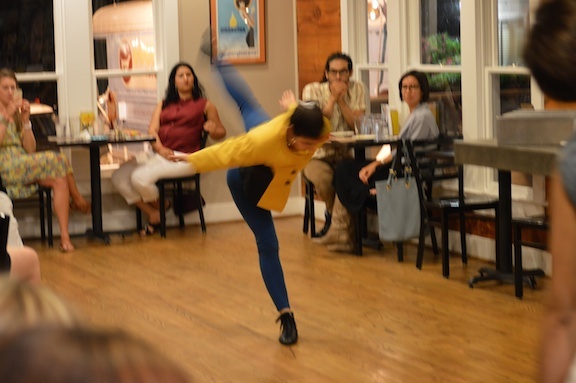 Frame Dance Productions’ Dinner/Dance 19. Photo by Mark Wozny. Shelly (Laura Gutierrez) was born without an ounce of fashion sense, but that’s the least of her problems. She has zero social skills, and if you are seen hanging around her your “klout” will immediately go down. Roxi (Danielle Gonzaba) has a serial selfie problem, and badmouths the lame 32 year-olds she’s stuck with as an intern this summer, however, to her credit she also has fantastic taste in footwear. Gretchen (Ashley Horn) does all the work and takes none the credit. She left the dream of law school behind to be an overworked office mouse. She has 13 cats. Need I say more? Gwenevieve (Jacquelyne Jay Boe) is a single mom, the “it” girl of the kooky clan, with dollar sign designs on Beetle. She mistakenly thought the evening was a date with the slacker. Alyssa (Shanon Adams), a mystery girl from California, seems to have an ungoogleable past. No one trusts her, and for good reason too. She was wearing a cheerleading get up. Yes, really! In Hance’s scenario, the characters saunter in, mingle, or sadly, get trapped getting grilled by me, while the audience gobbles such delicacies as coffee- roasted turnips/sprouted black calypso and mung bean fritters/fermented celery root sauce/African blue basil/mint/butter lettuce. Did you get all that? The food was as surreal as the experience. Perhaps it was during the confited and smoked carrots/French sorrel-ricotta puree/pecan-mushroom soil/black garlic vinaigrette/garlic blossoms when the dancing started. Sprawled out over the front, back, side and indoor areas of Good Dog, the “Five Two Tango,” set to music by Jonathan Russell, put into motion all the intrigue going down at the office. Later on in the meal, perhaps during the squash course, the “Index of Possibility,” with music by Robert Honstein, found our office workers in a pensive mood, touting gigantic coffee mugs, hanging in doorways, and generally spreading out over the space, looking lost, forlorn and perhaps wondering how they ended up dancing, while we were eating these badass smoked carrots. Hance has never been one to be comfortable on a traditional stage. She’s done many works where interaction is part of the plan. Dinner / Dance 19 may be the most thought through of this cluster of works. The performers—terrific all—stretched their acting muscles for Hance’s antics, and the dancing itself spoke to the tangled web playing out at their imaginary office water cooler. 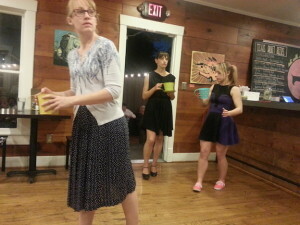 I had the ideal seat indoors, where I was able to watch three dances going on at once. Hance’s clever use of the space had an expansive feel. I appreciated the robustness of the movement vocabulary in such confined places. The anticipation of wondering when the Search Optimizer tribe would bust out dancing proved fun, too. In between their dance attacks they returned to “hanging out” mode, as if nothing all that unusual happened. I will say that Dinner / Dance 19 required considerable buy in from viewers/dinners. If you read the characters background and chatted up the performers before, you would be more likely to understand the situation when Gwenevieve plops down at your table to whine about Beetle tangoing with other women. As the last drop of whipped cream went down, we are left wondering; will Beetle ever show up to work on time? ; will Shelly ever learn which colors match? ; will Roxi make a bad selfie decision? ; will Gretchen ditch her frumpy outfits to go to law school? ; will Gwenevieve ever loose her queen bee status? ; will the FBI finally track down Alyssa? ; and will Search Optimizer go bust due to the employees spontaneous modern dance attacks in front of potential clients? I will never know the answers to these questions, but I do know that Hance and her “framers” are doing some of the most compelling and entertaining work in Houston. Nancy Wozny is editor in chief at Arts and Culture Texas and reviews editor for Dance Source Houston.